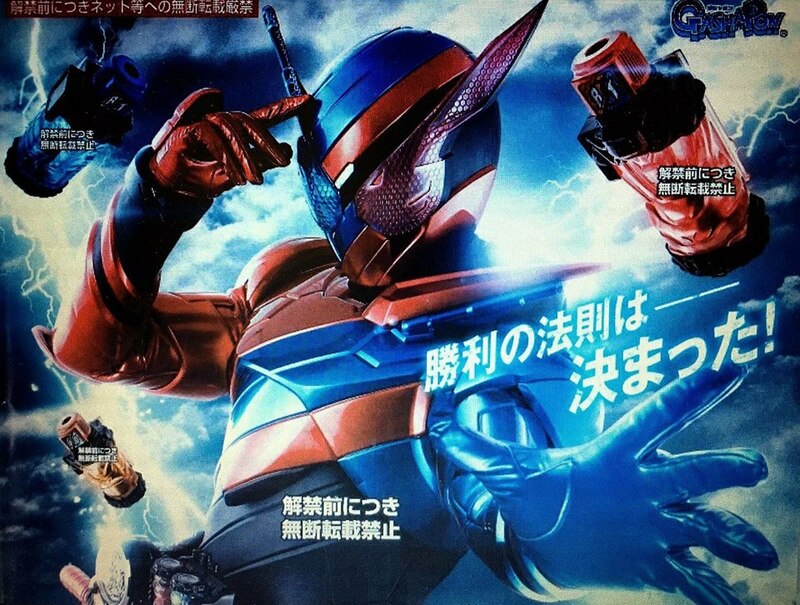 A scanned image for the Full Bottle gashapon flyer has surfaced revealing the tagline for the next, upcoming and final Heisei Kamen Rider series, Kamen Rider Build. As for the tagline, it is translated as "The law of victory has been decided! ", and with this revealed we will be asking the question "what kind of profession will Build's civilian identity be?" ...for some reason, that tag line makes me thing lawmaker/politician. It'd be an interesting twist... also, we've had law enforcement (Drive) and the tag line doesn't really fit lawyer, so yeah. Of course, this guess is out there enough that I wouldn't be surprised if I was completely wrong. What do you mean by "final" heisei series? Are we changing Periods? If yes, is there a name for the new one? Yup, apparently after this one the next rider will be a transition series between Heiden and the new Era. Japan is changing Era. The Current Emperor Akihito is abdicating his throne in 2019 to his sun Naruhito. Bringing a new Era to Japan and therefore. Making Build the last Heisei Rider Show. I get the impression the tagline is supposed to be "The law's victory— Has been decided!" with the "no" being the possessive not "of"? Just a thought. Yea next year new emperor of japan tajes over hence new period no name yet till next year. This is the last Hesei Period Series, the next year (2018-2019) Kamen Rider Series the Emperor will pass the throne to his son, marking a new Period, so yes next Rider Series after Build will be running trohugh the change of power/Emperor, and i can´t wait to see how this series will be developed. Didn't know Akihito would be abdicating. For those wondering his apparent civilian ID is that he is a physicist hence "law" like laws of physics. Well if he takes the thrown in 2019 then no it won't be. This would end in September with another starting in September of 2018. Kamen Rider Black RX is billed as the last Showa series but that show started about 10 weeks before Hirohito died. By the author's logic that would make Black RX the first Heisei show since it ENDED during Heisei's reign. I believe it would go by when the show started which would make Build's successor the final Heisei. It makes a whole lot more sense since A: It fits with the established way of things and B: the successor to Build will likely be completed in all but filming during Heisei's reign. It really doesnt make any sense to flat out call this the end of the heisei era for kamen rider. the only reason why the series since kuuga has been called the heisei era is simply because it was revived in the heisei era otherwise why arent Kamen Rider J and Zo considered Heisei Era riders? since the Heisei Era began in 1989. Technically Showa did end with Black RX as that was the last show to start and be plotted out before Hirohito died. That really isn't debatable if you use the true meaning of Showa and Heisei. The only reason that I think people call Shin/J/ZO Showa are because in tone they were closer to the Showa than Heisei, they were just basic short films with no tv shows and just had to be lumped in with one or the other, and because perhaps most importantly they were made under Ishinomori who was still alive. That really is the break with what is called Showa and Heisei is Ishinomori. Kuuga is called the first Heisei but really it was the first made without Ishinomori (at least other than some basic planning). Like it or not no matter what even Toei says Kuuga is the 4th Heisei production not the 1st. With that being said Build's successor will be the final Heisei show but honestly it matters little. One could honestly say we got a bigger change in tone with Kuuga and Decade/W than anything really corresponding to the reign of a Japanese emperor. It kind of was never a really good way to divide them to begin with. I mean what the hell is NeoHeisei? I never heard of Emperor Heisei being mutated into some new version of himself. It was always kind of based on a archaic way of tracking time. No attack on anybody. I just kind of never got this and I finally get a chance to put my thoughts into words. Take it or leave it but I would be interested to see my argument dissected some.